Chronic sinusitis refers to persisting inflammation of the sinuses and its treatment with recently developed balloon sinuplasty appears promising. Endoscopic balloon sinuplasty procedure is similar to angioplasty and is less invasive than conventional surgical treatments for chronic sinusitis aka chronic rhinosinusitis (CRS). Balloon sinuplasty procedure for sinusitis treatment helps in improving the normal drainage of the sinus cavities. drainage passages are widened and enlarged with a small, flexible endoscopic balloon catheter. Unlike the conventional surgical treatment for chronic sinusitis, balloon sinuplasty procedure does not involve bone and tissue removal and has a shorter recovery period. There are small paranasal cavities in the skull on the facial region and they are lined by mucus membrane and are filled with air. Mucus is discharged from these cavities into the nasal passage through ostia (opening). Sinusitis is the chronic inflammation of these cavities. The primary cause of chronic sinusitis is nasal inflammation blocking the mucus drainage, leading to infection, inflammation and pain in these cavities. If the sinusitis persists for more than twelve weeks, it is considered chronic. Untreated acute sinusitis can become chronic. Triggers and predisposing factors for chronic sinusitis. Sinusitis is a much prevalent illness, affecting individuals of all age groups. Treatment with anti-inflammatory medicine, painkillers and antibiotics are considered for sinusitis. Nasal sprays and drops: Saline nasal sprays, corticosteroid nasal sprays or corticosteroid nasal drops are recommended by physicians to clear the blocks of ostia and also to reduce inflammation in the early stages of chronic sinusitis. Though nasal sprays containing Zinc compounds have been used successfully for sinusitis, FDA has advised against their use. The zinc nasal compounds can damage the sense of smell by permanently damaging the smell nerve endings. Steam inhalation treatment: Breathing steam has been found useful in treatment of sinusitis controlling inflammation and opening up the blocked ostia. Antimicrobial treatment: The physician may consider treatment with antibacterial (amoxicillin, doxycycline or trimethoprim-sulfamethoxazole) or antifungal preparations (amphotericin B) if an infection is the cause of chronic sinusitis. Nasal irrigation: Flushing out the nasal passage with sterile saline water with the help of bulb syringes or neti pots help in relieving the pressure, blockage and pain. For patients with chronic sinusitis if the response to conventional treatment is not satisfactory, there are two surgical options available. Functional endoscopic sinus surgery (FESS): FESS is the conventional surgical treatment involving removal of bone and/or tissues to make wide passage for the cavity to drain. This surgical procedure requires hospitalization, rest and a long recovery period. Balloon sinus dilation (BSD) or balloon sinuplasty: This procedure introduced in 2005 is the latest non invasive method for the treatment of chronic sinusitis. The advantage of BSD lies in minimal anesthetic use, short procedure time and fast return to normal activities. 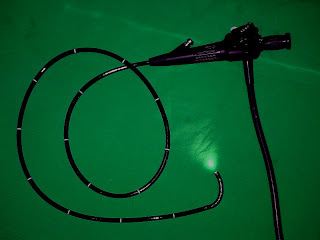 Equipment for balloon sinuplasty: A flexible endoscope (Rhinoscope or Nasoscope), guide catheter, balloon catheter and irrigation catheter are used while performing this procedure. Ct scan and endoscopic visualization is done prior to sinuplasty. With endoscopic visualization a guide catheter is introduced into sinus opening. Once access to the ostium of the cavity under treatment is located, a balloon catheter is positioned into the blocked ostium. Balloon sinuplasty catheter is inflated for short duration with predetermined pressure. The sinuplasty balloon is deflated and the catheter is removed after treatment. If irrigation system incorporated into the balloon sinuplasty catheter, irrigation is activated to flush out the mucus and pus, if any. If the balloon sinuplasty catheter is not equipped with irrigation system, a separate irrigation catheter has to be inserted to flush out the cavity of its accumulated mucus. When sinusitis becomes chronic, it is very difficult to avoid recurrences. Taking preventive measures and also early treatment with balloon sinuplasty will go a long way in alleviating the severity of chronic sinusitis.